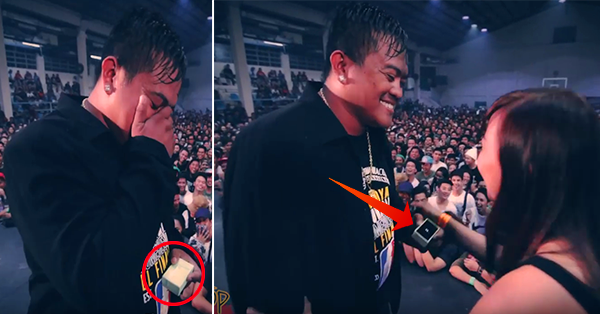 Watch: This FlipTop Rap Battle Unexpectedly Turned Into Something Cheesy! FlipTop was founded by Alaric Riam Yuson back in 2010 to promote the Pinoy hip-hop scene. Rappers usually throw profanities and insults at their opponents in a rhythmic rhyming pattern. The two contenders are each given three rounds a time limit to deliver their verbal bars. Very different from the FlipTop rap battles we have grown used to, this particular battle went viral after the usual bad mouthing gave way to cheesy lines. This particular battle was between Shernan and Lil Sisa. Shernan started the battle by admitting that he had a major crush on Lil Sisa two years ago. He then started rapping sweet lines at her as the crowd went wild. But when Lil Sisa took the mic, she made sure to dominate Shernan's sweet hits with unexpected lines and smooth bars. She then verbally assaulted him by making fun of his personal appearance as the crowd grew even wilder. Once it was Shernan's turn again, all he had were 'hugot' lines, which added more humor to the already peculiar proceedings. After three rounds, Lil Sisa won, garnering a score of 4 against 1. This was her first battle after being on hiatus for some time. The two are actually a real-life couple and are even married. This made the crowd even more delighted about their battle knowing that they shared the same passion.